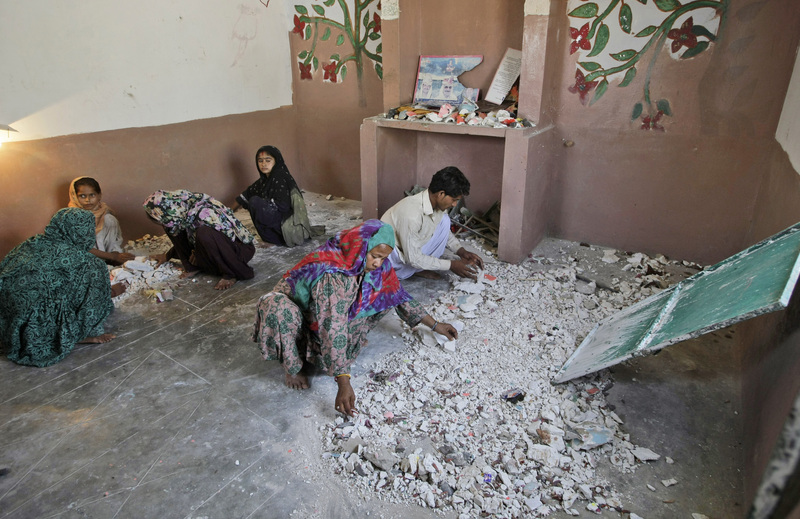 KARACHI, Pakistan Pakistan's blasphemy laws may be used to punish Muslims suspected of ransacking a Hindu temple, an intriguing twist for a country where harsh laws governing religious insults are primarily used against supposed offenses to Islam, not minority faiths. The blasphemy laws, sections of which carry the death penalty or life imprisonment, have drawn renewed international scrutiny this year after a young Christian girl in Islamabad was alleged to have desecrated the Muslim holy book, the Koran. A Muslim cleric now stands accused of fabricating evidence against the girl, who has been freed on bail and whose mental capacity has been questioned. Police officer Mohammad Hanif said Sunday the anti-Hindu attack took place Sept. 21. The government had declared that day a national holiday - a "Day of Love for the Prophet" - and called for peaceful demonstrations against an anti-Islam film made in the U.S. that has sparked protests throughout the Muslim world. Those rallies took a violent turn in Pakistan, and more than 20 people were killed. Hanif said dozens of Muslims led by a cleric converged on the outskirts of Karachi in a Hindu neighborhood commonly known as Hindu Goth. The protesters attacked the Sri Krishna Ram temple, broke religious statues, tore up a copy of the Bhagavad Gita, a Hindu scripture, and beat up the temple's caretaker, Sindha Maharaj. "The attackers broke the statues of (Hindu deities) Radha, Hanuman, Parwati and Krishna, and took away the decorative gold ornaments," Maharaj said. "They also stormed my home and snatched the gold jewelry of my family, my daughters." Maharaj and other Hindu leaders turned to the police, who registered a case against the cleric and eight other Muslims. But none of the suspects had been found as of Sunday, police said. Officials said the case against the attackers was registered under Section 295-A of the blasphemy laws, which covers the "outraging of religious feelings." That section of the law can apply to any religion and carries a fine or up to 10 years imprisonment. The Asian subcontinent's British rulers originally framed blasphemy laws partly to prevent violence between Muslims and Hindus. Muslim-majority Pakistan was carved out of India in 1947, and under the military rule of Gen. Muhammad Zia ul-Haq, a fervent Islamist, the statutes covering blasphemy were toughened in the 1980s. Area police chief Jaffer Baloch said authorities were simply considering the Hindus' complaint under the relevant section of the law. Islam's Prophet Muhammad "teaches us to respect others' religions so that ours shall also be respected," he said. "Like us, Hindus have their own faith and religion and they do have sentiments for their Bhagavad and gods." Human rights activists say Pakistan's blasphemy laws are too broad and vague, and are often used by people who are trying to settle scores with rivals or target religious minorities, who make up 5 percent of Pakistan's 180 million people. Although many Muslims are accused of insulting Muhammad or other acts deemed blasphemous, minorities are disproportionately represented among the defendants, rights groups say. Hindus and Christians are among prominent minorities who fear the blasphemy laws. Also frequently blamed for blasphemy are Ahmadis, who consider themselves Muslims but are reviled as heretics by mainstream Muslims. Pakistan is not known to have actually executed anyone for blasphemy, and while courts often set the accused free on technical grounds or other reasons, many extremists have killed people who were let go by judges. Even speaking out against the blasphemy laws can put people in danger. Two prominent politicians, including the sole Christian member of the federal Cabinet, were assassinated in 2011 for urging reform of the law. The politicians, Punjab province Gov. Salmaan Taseer and Minister for Minorities Shahbaz Bhatti, had spoken out in defense of Asia Bibi, a Christian sentenced to death in 2010 for allegedly insulting Islam's Prophet Muhammad. Bibi, whose case prompted international criticism, is believed to be the first woman condemned to die under the statute and remains in prison. The laws retain broad support in Pakistan, where Islamic conservatism is on the rise alongside extremism and Muslims are highly sensitive about their faith. Taseer's killer, for instance, was hailed as a hero in many quarters. Thousands of people rallied to support him, and lawyers showered him with rose petals.